We found 154 results matching your criteria. Replacement bulb with tungsten filament wires, glass tubes and copper stems. Specifically designed to deliver the brightest, whitest, far-reaching light beam without compromising battery life. Bi-pin, vacuum-sealed and extremely bright for its size. Specifically designed to deliver the brightest, whitest, far-reaching light beam without compromising battery life. Bi-Pin, vacuum-sealed and extremely bright for its size. For single cell AAA Solitaire flashlight. Specifically designed to deliver the brightest, whitest, far-reaching light beam without compromising battery life. Works with C or D battery flashlights. Bulbs sold one per card. LED headlight, 17 lumens, 13 hour run time, 15 meter beam distance, 8 LED white, 2 red blinking LED. Push button switch. Uses 3 AAA batteries, included. 2.3" L x 2.7" W, .28lb. Conversion bulb operates with any 2 cell AA, C, or D flashlight. 10 year bulb, 100,000 hours of use. 30 lumen 3 volt replacement. Conversion bulb operates with any 3 cell, 4 cell, or 6V lantern or flashlight. 100,000 hours of use. 40 lumen, 4.5 volt. Includes 4 colored filters, red, green, blue and yellow, plus clear. Rubber bezel cover holds filter in place. Fits HP7R, HP7, HP7TAC, PX46, PX45, TX44, TX40, G40, G35 and HL8 flashlights. Luxeon LEDs for 360 degrees of light. Lightweight and portable, durable rotating switch and a handle hang hook. 70 hour run-time on 4 AA batteries (not included). 40 lumens with a beam distance of 15 feet. Assorted colors (no color choice available). LED bulb never needs to be replaced. Impact-resistant housing. Built-in hanger ring. Rubber flashlight. 40 hour run time, 50 meter beam distance, uses 2 AA batteries, included. 6.20" L x 1.14" W, 3.1 oz. Push button switch. Blue, red, purple and green colors. Aluminum silver body, push button tail switch for one handed operation and a sturdy clip. 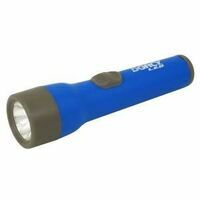 One super bright lifetime LED, 6 lumens and over 100 hours run time with 2 AAA alkaline batteries, included. Typical weight is 1.5 oz. with batteries. 5.720" x 0.659". Adjustable light head and elastic head strap for hands-free use. Top mounted On/Off slide switch. Panel swivels 50 degrees. Three 5MM LEDs give 70 hours run time and 28 lumens for a 15 meter beam with included 3 AAA batteries. Fits RE1019 rechargeable Mag Charger flashlight. Industrial 9 LED flashlight. 42 lumens, 15 hours, 32 meters. Uses 3 AAA batteries, (Included). Plastic. 4.04" L x 1.06" W, .5lb. Push button tail cap. Weather resistant, carabiner hang ring. Shatterproof construction, lanyard. Contains everything needed to turn an incandescent AA Mini Maglite into an LED flashlight, with an on/off tail cap switch operated with one hand. Replace the existing bulb with two pin/three LED module (simple instructions on the package) and replace the tail cap with the tail cap switch. The LEDs are nearly shockproof, and emit a bright white light, as opposed to the yellow glow of incandescent bulbs. 100,000 hour average life, uses less power, AA batteries can last up to four times longer, up to 20 hours. Note, this upgrade will void the MAG Instrument limited lifetime warranty covering the AA mini maglite flashlight.